Last week, I got to spend an hour in the company of Noah And The Whale at their rehearsal studios in East London. 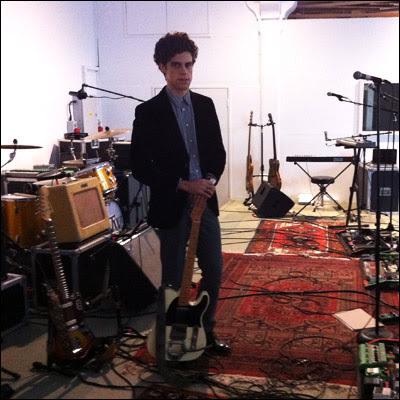 Charlie Fink, the band's charming frontman, gave me a chatty tour of the facility (a converted synagogue), which I taped and put on the radio. Here it is. The band's new CD, Last Night On Earth, is out on 7th March and it's a right little corker. Considerably more breezy than their last effort - gut-wrenching break-up essay The First Days Of Spring - it hitches a lift with Springsteen, Tom Petty and Lou Reed across the musical highways of the USA. Charlie also noted that the album, his third, clocks in at exactly 33⅓ minutes. Now That's What I Call Unnecessary Attention To Detail. First single, L.I.F.E.G.O.E.S.O.N., is both ear worm and tongue twister. It's accompanied by the following eye candy.